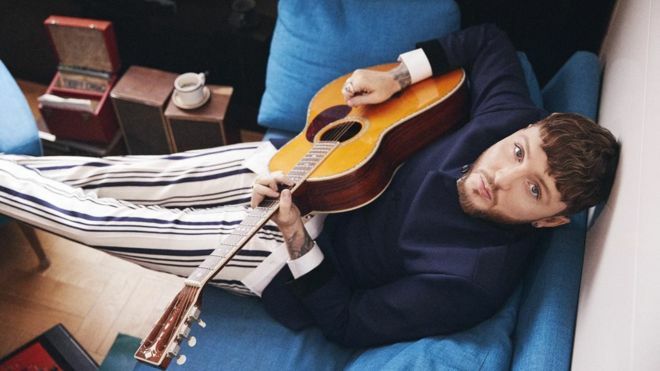 Up to now, James Arthur has built his career on ballads. From his X Factor single, a cover of Shontelle’s Impossible, to the global smash hit Say You Won’t Let Go, the singer has proved he can tug on your heartstrings like a puppy on a postman’s trousers. The 29-year-old penned the song with Swedish pop kingpin Max Martin, who “floated in and out” of the studio, presumably in between making hit records for Taylor Swift and Lana Del Rey. Born in Redcar, Teesside, in 1988, he had a troubled childhood after his mother, a model and marketing professional, split up from his delivery driver father. When he was nine, his mother remarried and the family moved to Bahrain. Here, the youngster flourished, making new friends and winning his first singing role in a school production of Pirates of Penzance. But life came crashing around his ears when his mother and step-father divorced. After enjoying a life of luxury in the Middle East, he moved back to Redcar (he calls it a “rags-to-riches and back to rags tale”) and ended up in a rough school where singing and performing were frowned upon. Angry and frustrated, he started to skip classes, and ended up having major rows with his family – sometimes sleeping rough after being kicked out of the house. It was while he was in foster care that Arthur taught himself guitar and started to pour some of his frustrations into music. He joined several bands – Traceless, Moonlight Drive, The Emerald Skye – and even recorded his own EP as The James Arthur Project in 2012. But it was The X Factor that made his name. Arthur’s parents reunited for the first time in 20 years to watch his audition – but, in retrospect, he was probably not suited to the pressure of competing in a reality series. After the second live show, he suffered an anxiety attack backstage and had to be treated by paramedics. Although he went on to win the series, success took a toll on his mental health – and he began to lash out in a series of increasingly bizarre and bad-tempered blunders. He made unflattering remarks about Rita Ora, with whom he’d had a brief fling; got involved in a public spat with One Direction; and then attacked his own PR team for daring to promote his music. When he referred to another rapper as “queer” in a diss track, the star was severely rebuked for his homophobic language, and his career went into nosedive. “Somebody should have told him to shut up and just put the records out,” said Simon Cowell, shortly before he pulled the plug on Arthur’s recording contract. Losing his livelihood gave the singer panic attacks and suicidal thoughts, but he slowly started to turn things around. He gave up drugs, which he said were exacerbating his anxiety, and managed to kick a gambling habit for good measure. Then he wrote a song… and not just any song. Say You Won’t Let Go, a romantic, love-you-til-the-end-of-time ballad, is exceptional in its simplicity and directness. It not only became the star’s signature song – but it single-handedly resurrected his career. Even Cowell noticed, re-signing the singer to his Syco record label to release the song in the UK. Proving it wasn’t a fluke, Arthur followed up the single with a number one album titled, with piercing self-awareness, Back From The Edge, and a three-month US tour with OneRepublic. Naked is the first single since the comeback – but rather than the start of a new campaign, he says it’s a “standalone thing”. The song’s video features actress Cressida Bonas who, the tabloid press were quick to point out, is Prince Harry’s ex-girlfriend. “I don’t take any notice of that stuff,” says Arthur, “I didn’t even know he was getting married. Having taken steps to tackle his own health issues, the star seems relaxed and amenable throughout our chat – even apologising (unnecessarily) for his “lack of energy”. And he’s looking forward to buckling down to work on his next album. “I’ve taken up the piano and the songs I’m writing now are bringing out a different side of me,” he says.